The DR-220S has been one of our best selling acoustic guitars with the look, sound, and build quality that first time players and professionals expect to hear when they pickup an Epiphone. The dreadnought style is often thought of as the classic-go to shape for bluegrass, folk, rock, country, and everything in-between. The dreadnought sound is commanding when required but it's also balanced which means that at any volume, you can be heard clearly and hear yourself well, too. Many guitars claim to be a “classic dreadnought” but only an Epiphone comes with a Limited Lifetime Guarantee and Gibson 24/7/365 customer service and a century’s worth of experience. Visit your Authorized Epiphone Dealer today and pick up a DR-220S. The DR-220S features a Solid Sitka Spruce top. Spruce is one of the finer tonewoods with a rich complex tone that begins to breath and improve with age the more its played. So play the DR-220S as much as you can! 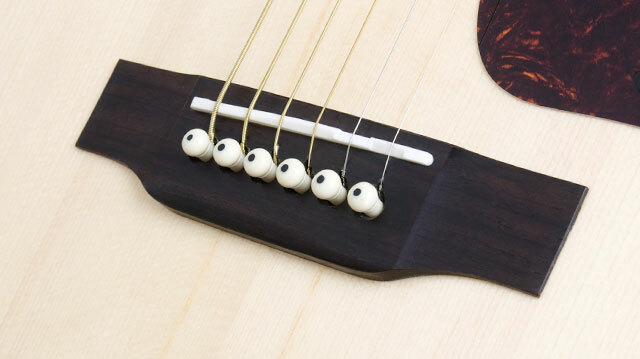 The body is made from Select mahogany and the bridge is glued rosewood. There is a lot of stress put on a guitar between the nut and bridge and rosewood has proven to be both a long lasting and perfect compliment to a Sitka Spruce Top. The classic black vintage style pickguard is easy to spot from stage or across the room and has the iconic "Epiphone" E.
The DR220S mahogany neck is glued-in with dovetail joint at the 14th fret and features a 25.5" scale, a SlimTaper™ shape, and a rosewood fingerboard with dot inlays. Our iconic Sloped Dovewing headstock completes the look with premium tuners. 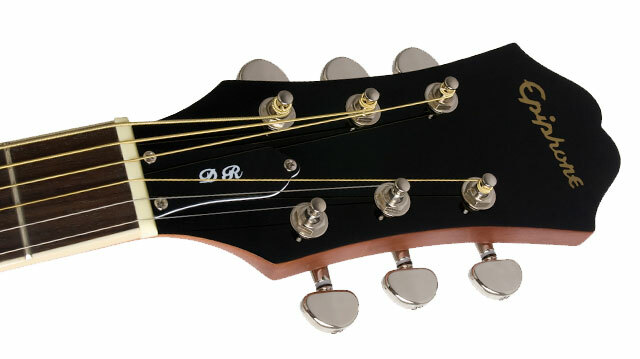 The DR100 is available in Natural (NA).